"Jiufotang Early Cretaceous Habitat reconstruc"
Copyright © 2015 Michael Rothman. This image is available for reuse purchase. 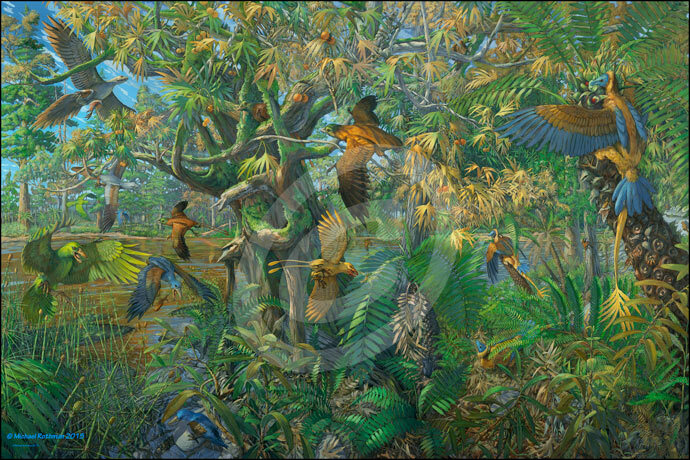 Michael Rothman DescriptionLarge scale reconstruction of the fauna and flora of the Early Cretaceous Jiufotang habitat of Northeastern China with basal birds, enantiornithines, ornithines, cycadeoids, Bennettitales, ferns, archaic mammals, insects and amphibians. This is a Lacustrine habitat dating back about 120 mya. This habitat may have have been a seasonally mild-temperate region. The painting measures 4.0 ft X 6.0 ft. and was produced with archival acrylic emulsion paint.